By Melissa 1 Comment - The content of this website often contains affiliate links and I may be compensated if you buy through those links (at no cost to you!). Learn more about how we make money. Last edited June 27, 2016 . 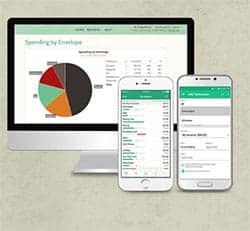 I’m the one who handles the budget in our family, and for years I’ve been struggling to find the perfect software to help me handle our budget. 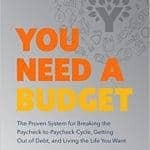 Budgeting was easy when I was single, and not too complicated when we were first married. Now, however, with three kids, a mortgage, student loans, medical expenses, retirement savings, etc., the budget is a lot more complicated. I sometimes feel like I’ve tried every software out there without success, but that was before I found Goodbudget. 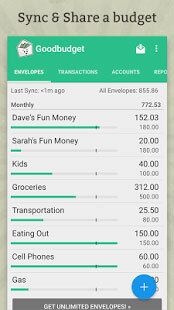 Goodbudget is based on the envelope system, so it’s perfect for the Dave Ramsey fans out there. I tried the traditional envelope system before—bringing cash with me everywhere in my little envelopes, but that simply didn’t work for me. If I went to the grocery store and bought groceries, toiletries, and entertainment items like a magazine, I had three different categories of purchases. What was I to do? Divide out all the expenses between envelopes when I got home? Pay for three separate transactions from my three separate envelopes? What a pain! And that’s not even mentioning the times I was at the check out line and realized I’d forgot my cash entirely. 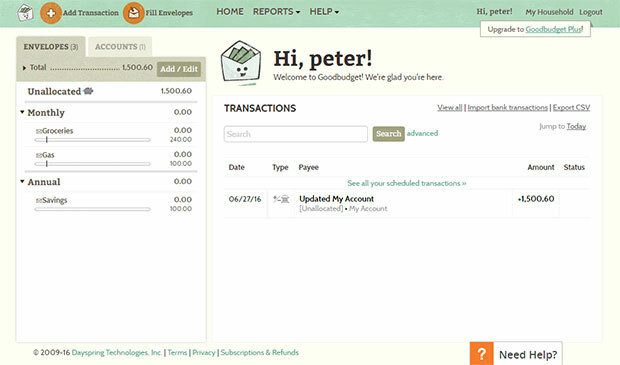 Goodbudget is set up like the envelope system, but the envelopes are virtual. You set up your virtual envelope for each category and then budget how much you plan to spend out of those envelopes during a particular time frame, which you can choose—weekly, every two weeks, monthly, etc. You fill the envelopes virtually, and then deduct the transactions as you make purchases. Goodbudget has a number of features that I don’t use because I’m not all that hi-tech. I don’t import my transactions electronically; I do that manually. If you choose to do it electronically, it would likely save a great deal of time, but I prefer to enter them manually, which isn’t that time consuming. In addition, I don’t have a smartphone, so I don’t access my accounts with a device even through there is an Android and iOS app that works wonders by all accounts. Instead, I tend to check my balances in Goodbudget on my laptop at home before I go out. While I like Goodbudget for the most part, I find that it is lacking in certain ways. For instance, we have some credit card debt that we’re paying down. I’d like to have a separate place for that to keep track of how the balance is going down, but if I put it in Goodbudget, that whole credit card amount is subtracted out of my cash flow, aka money available to budget, so it makes figuring out how much I have to allocate to my other envelopes very difficult. Instead, I use Goodbudget for my monthly budget needs, and I use The Budget Kit to track our net worth as well as our debts that we are repaying. How Much Does Goodbudget Cost? I wanted to go the free route, but I found that option didn’t have enough flexibility for our complicated budget. If I was single, this would be the perfect option. I have used the Plus version for a few months now, and I’m planning to switch to the yearly fee to save money. There have been a few times where I have not understood how to do a transaction, so I e-mailed customer support. The answers have always been prompt (coming within 24 hours), and they have been thorough so I know how to do what I asked by the time I finish reading the e-mail. If you’re frustrated by the budgeting software out there and you like the budget envelope system, I highly recommend Goodbudget. Give Goodbudget A Try Today! Last Edited: 27th June 2016 The content of biblemoneymatters.com is for general information purposes only and does not constitute professional advice. Visitors to biblemoneymatters.com should not act upon the content or information without first seeking appropriate professional advice. In accordance with the latest FTC guidelines, we declare that we have a financial relationship with every company mentioned on this site. I think Goodbudget will do what you want as far as debt. I am using it that way and it doesn’t affect my number to budget.